Kalrez® perfluoroelastomer parts last longer and seal more effectively than other elastomers due to their exceptional heat resistance. Longer-lasting seals can be a direct route to extended mean time between replacement and lower cost of ownership. The outstanding thermal stability and excellent chemical resistance of perfluoroelastomer parts are due to the strength of its carbon-fluorine bond in the perfluorinated chain. Even after long-term exposure to temperatures up to 327°C, Kalrez® parts retain elasticity and recovery properties better than other high temperature elastomers. They resist hardening and embrittlement, the principal heat-related cause of seal degradation and failure. And in high-vacuum semiconductor applications, Kalrez® parts exhibit negligible outgassing over a wide temperature range. 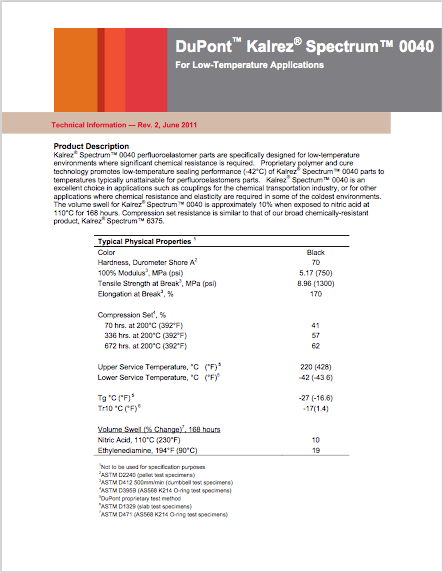 Whenever the challenge is maintaining high performance in high temperatures and harsh chemicals, DuPont heat resistant elastomers provide a full portfolio of cost-effective choices. Often, heat isn’t the only challenge for an application. 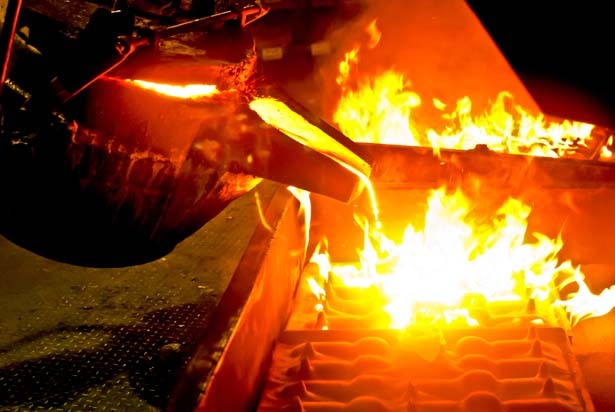 Specifying a heat resistant elastomer that also has the required combination of flexibility, durability and chemical resistance can be the key to success. Viton® fluoroelastomer: Continuous heat resistance to 200°C, with higher excursions possible. Excellent resistance to fuels, lubricants and chemicals. Kalrez® perfluoroelastomer parts: Heat resistance to 327°C, and resistance to over 1800 chemicals, with many compounds available for different applications. DuPont™ Kalrez® 7075 perfluoroelastomer parts are a carbon black filled product that has enhanced physical performance properties including very low compression set and improved seal force retention. This product utilizes a proprietary cure technology with mechanical properties designed for improved sealing performance in both high temperature environments and temperature cycling situations. Kalrez® 7075, for the chemical processing industry, provides even greater sealing performance in dynamic applications where low friction is required. 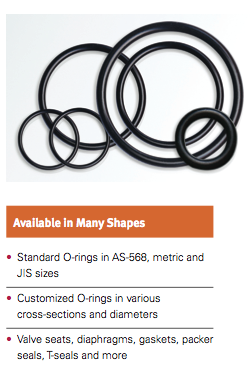 Kalrez® 7075 was specifically developed to be used as an o-ring or customer-sealing component in the chemical and hydrocarbon processing industries, with an improved thermal resistance that extends maximum service temperature to 327°C (620°F). 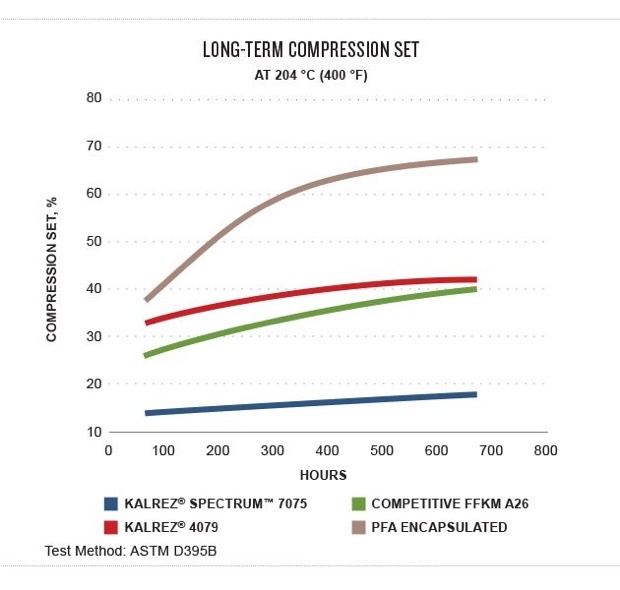 Kalrez® Spectrum™ 7075 offers the enhanced elastomeric properties outlined above while providing chemical resistance better than the industry standard, set by Kalrez® 4079. 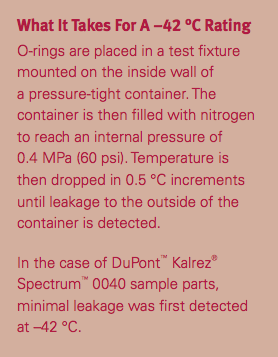 Fight leaks and chemical attack at temperatures down to –42 °C with new DuPont™ Kalrez® Spectrum™ 0040 O-rings, gaskets and more. At an oil refinery in midwestern Canada, DuPont™ Kalrez® Spectrum™ 0040 mechanical seals for various hydrocarbons operated continuously for six months before a scheduled shutdown. They replaced O-rings made of fluoropolymer- encapsulated silicone which had an MTBR (meantime between repairs) of about one week. Temperatures ranged from –48 °C to +15 °C and back to –48 °C in a 24 hour period. 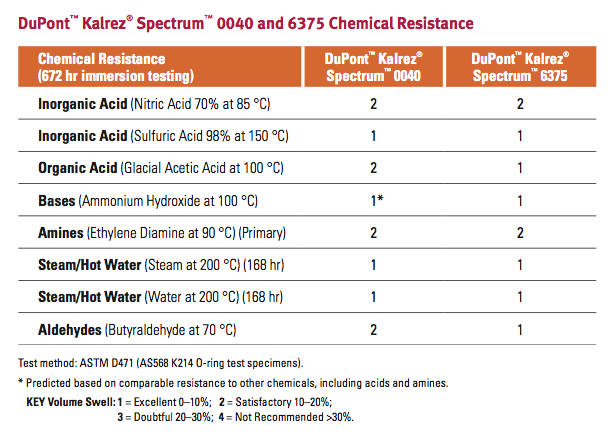 Unlike some low-temperature seals, DuPont™ Kalrez® Spectrum™ 0040 parts help withstand attack by most aggressive chemicals including Nitric, Sulphuric and Ammonium Hydroxide and Amines. They provide a more reliable alternative to silicone and other low- temperature elastomer parts offering chemical resistance. In applications where there are mixed streams, unknowns in the process or process excursions, DuPont™ Kalrez® Spectrum™ 6375, offers the broadest chemical resistance. 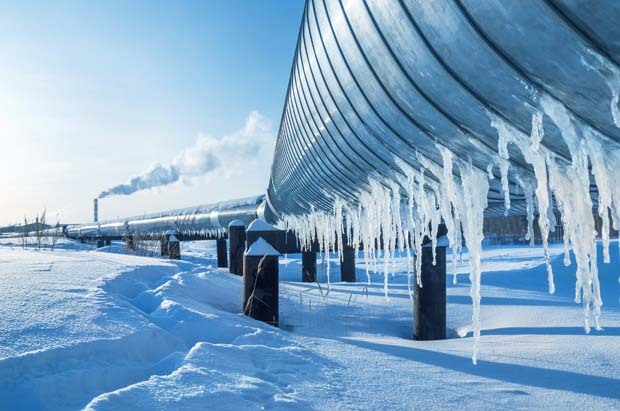 Improved sealing performance in extreme low temperature environments is a major benefit in equipment used in high latitude, high altitude or other freezing cold environments. 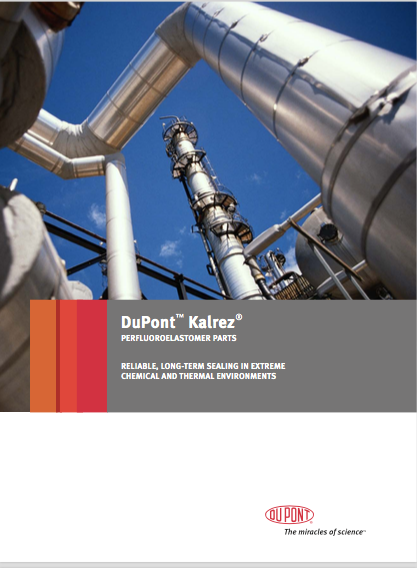 Chemical and hydrocarbon processing equipment involving cold startup, hose couplings for chemical transport equipment, and manhole seals for rail cars, aircraft and other aerospace vehicles are among the many potential applications for DuPont™ Kalrez® Spectrum™ 0040 parts. When the heat is really on, you need a high temperature grease or high temperature oil that can take it without performance degradation. 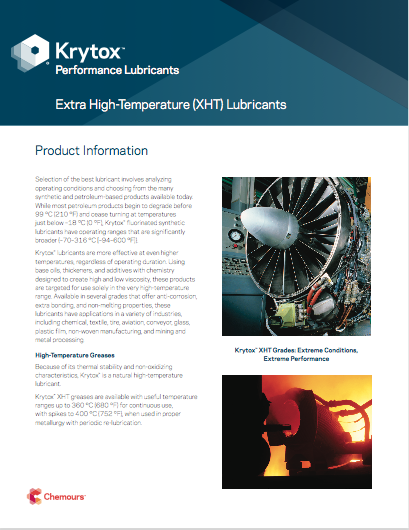 Krytox™ XHT synthetic lubricants are specially formulated for extreme high-temperature applications. Krytox™ XHT is a perfluoropolyether- (PFPE-) based polymer composed of fluorine, oxygen and carbon. No hydrogen is present in the molecule, resulting in exceptional stability and non-flammability. Targeted for use in the very high-temperature range, these ultra-high-temperature-grade oils and greases offer low evaporation and remarkably stable lubrication performance at temperatures above the range of normal PFPE-based oils or conventional hydrocarbon-based lubricants. Krytox™ XHT lubricants are available in several grades that offer anticorrosion, extra bonding, and non-melting properties. These lubricants serve a variety of industries, including chemical, textile, tire, aviation, conveyor, oil and gas, glass, plastic film, and non-woven manufacturing, as well as mining and metal processing. Krytox™ synthetic lubricants offer outstanding performance at temperatures from two degrees Kelvin (2º above absolute zero). Krytox™ lubricants for low temperatures have pour points that are lower than -75 ºC (-103 ºF). Even below these temperatures, Krytox™ lubricants are not damaged. When they return to a fluid state, they will continue to lubricate as before. At extreme low temperatures, Krytox™ has even been used to improve heat transfer in cryostats.